It is important to differentiate low grade malignant peripheral nerve sheath tumors (MPNSTs) from benign nerve sheath tumors as MPNSTs may require a more aggressive treatment strategy during and after initial resection. Loss of expression of the trimethyl Histone H3 at the Lys27 position (H3K27-me3) has recently been described in MPNSTs, and may help distinguish this tumor from pathologic mimics. A 43-year-old woman presented with symptoms of radiculopathy and a history of pelvic radiation for cervical cancer 7 years prior. 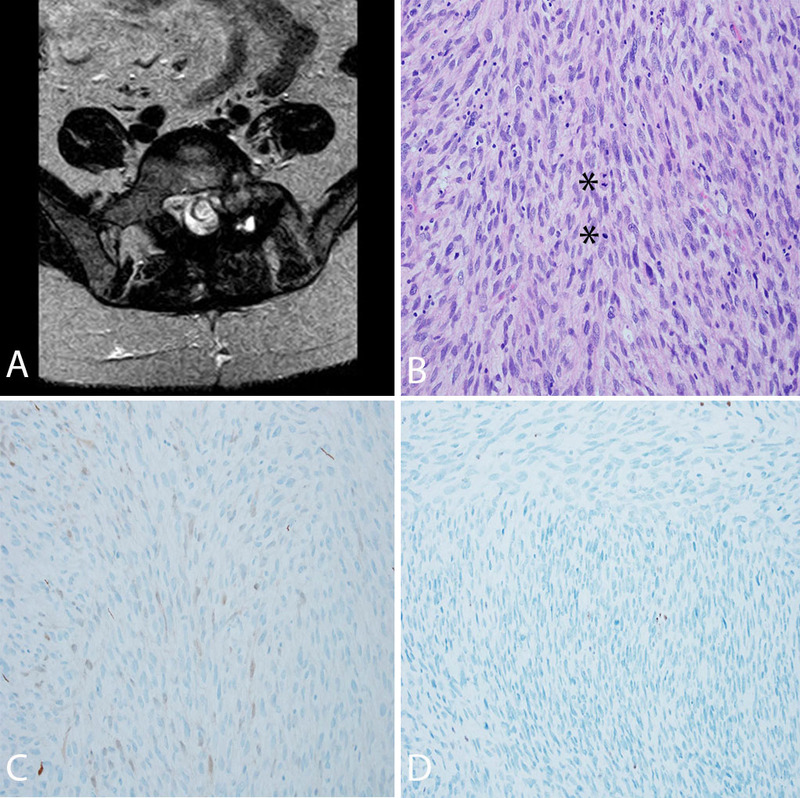 Imaging and surgical pathology were initially consistent with a L5 schwannoma, including spindle morphology without mitoses and retained S100 expression (Figure 1). After an aggressive recurrence and subsequent resection 11 months later, pathology was consistent with high grade MPNST including heightened mitotic activity, loss of S100 expression (Figure 2). After the identification of MPNST, H3K27M me3 immunostaining was applied to both the initial and recurrent pathological specimens. The initial specimen demonstrated patchy loss of H3K27M me3 expression, more consistent with low grade MPNST than schwannoma. Ultimately the patient developed diffuse metastatic disease, including multiple intracranial metastases. Her condition declined and she died approximately 15 months after initial resection. 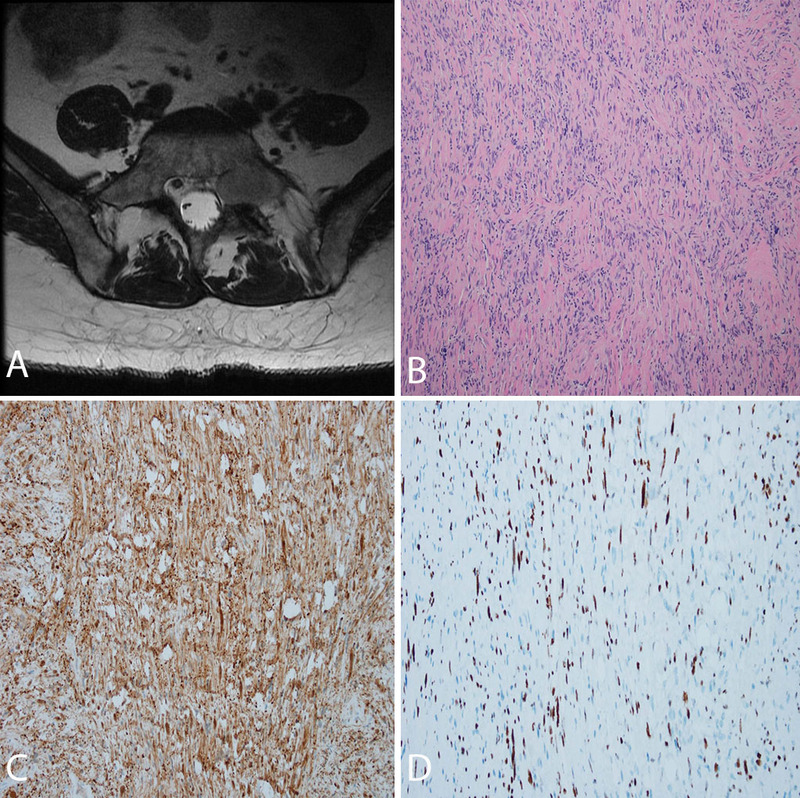 This case highlights the role of H3K27M me3 immunostaining to help differentiate MPNSTs that may mimic more benign nerve sheath tumors, especially in patients who have a history of radiation to the region in question.